"Scopes Trial," originally by Brown Brothers, Sterling, PA, 1925. Via Wikipedia. Colorized by PHS, 2015. July 2015 marks the 90th anniversary of the Scopes Monkey Trial, one of the most famous court cases in American history. Defending substitute high school teacher John Thomas Scopes was Clarence Darrow, one of the celebrity lawyers of the day. William Jennings Bryan—the “Great Commoner,” three-time Democratic nominee for President, and Presbyterian Church in the U.S.A. ruling elder—argued for the prosecution, the State of Tennessee, which alleged that Scopes had broken the Butler Act  by teaching human evolution  at a state-funded school. Billed as a grand showdown between religion and science, the trial would play out in a rural Tennessee courthouse amid sweltering summer heat. For such a famous trial, the legal stakes were relatively small: if found guilty, John Scopes would be fined $100. So why did the trial attract so much attention? Part of the reason is its relation to the Fundamentalist-Modernist Controversy. Historians date the Fundamentalist-Modernist Controversy from 1922 to 1936, though its roots can be traced back another fifty years. By the mid 1920s, the battle between Fundamentalists, who believed in the literal truth of the Bible, and Modernists, who believed religion should progress with modern society, embroiled most Protestant denominations. It was particularly divisive among Presbyterians, contributing to the formation of the Orthodox Presbyterian Church  in 1936. Conservatives reacted quickly. 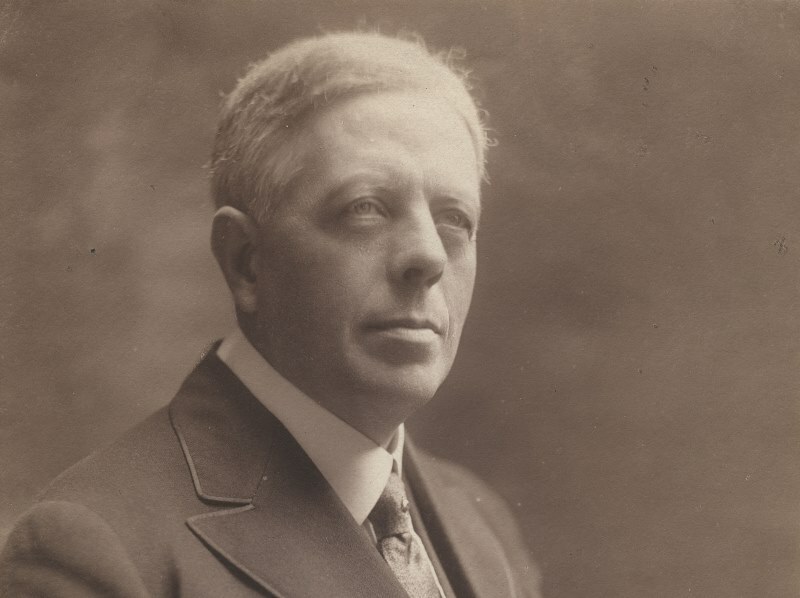 The 1923 PCUSA General Assembly voted to reaffirm the Five Fundamentals  adopted at previous assemblies; it also instructed the Presbytery of New York to make sure that the teachings of the First Presbyterian Church in New York City were in line with the Westminster Confession. Liberal Presbyterians drafted the Auburn Affirmation in response, defending doctrinal liberty in the church. Its signers accepted the Westminster Confession but denied its infallibility. A convert to Presbyterianism, Bryan had served as Secretary of State under fellow Presbyterian Woodrow Wilson. Although Progressive in his politics, he espoused a Fundamentalist cultural agenda. 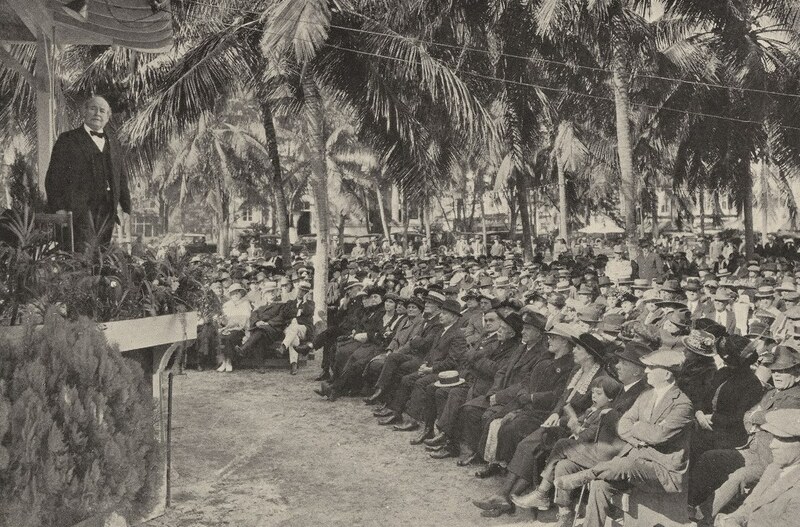 His “Bryan Bible Talks,” which were originally preached at the First Presbyterian Church in Miami, reached millions through the nation’s newspapers. Following World War I, Bryan led the crusade against Darwinism, stating that, “There has not been a reform for twenty-five years that I did not support, and I am now engaged in the biggest reform of my life.” Bryan thought evolutionary theory contradicted the Bible, and he feared the consequences of an unfettered Social Darwinism, especially to the causes of workers’ rights and women’s suffrage. A former lawyer, Bryan was a natural choice to argue for Scopes’s prosecution. (Ironically, he thought that a guilty verdict should not require John Scopes to pay a fine and offered to help Scopes pay it.) Though Bryan and the agnostic Darrow shared many of the same political views, the trial quickly became defined as a battle between the forces of Fundamentalism and Modernism, and headlines to that effect proved irresistible to the media. The trial was the first to be broadcast on radio. Blocked by the judge from allowing most of his witnesses to testify in person, Darrow called Bryan to the stand as a Bible expert. How Bryan conducted himself depends on your source. Some portray him as a theological simpleton humiliated by the brilliant Darrow—a premise made popular by the play and movie adaptation of Inherit the Wind . Others claim that the exchange was a fruitless back-and-forth. The facts show that the judge ordered Darrow's questioning of Bryan to be expunged from the record; he later prevented Bryan from cross-examining Darrow and from giving the prosecution's final statement, which history remembers as “Fighting to Death for the Bible.” Scopes was found guilty on July 21, 1925, and fined $100. Later, the Tennessee Supreme Court upheld the constitutionality of the law but reversed Scopes’s conviction, ruling that the judge, and not the jury, should have set the fine. Bryan died on July 26, five days after the end of the trial--a defeated man to some, to others an unbowed champion of common people everywhere. The Scopes Trial did not settle the debate between Fundamentalists and Modernists. Ninety years later, that theological and cultural dispute continues. You can read more blog posts about fundamentalism  on our site. Don’t forget to check out our blog page  which is constantly updated with new stories on Presbyterian history. 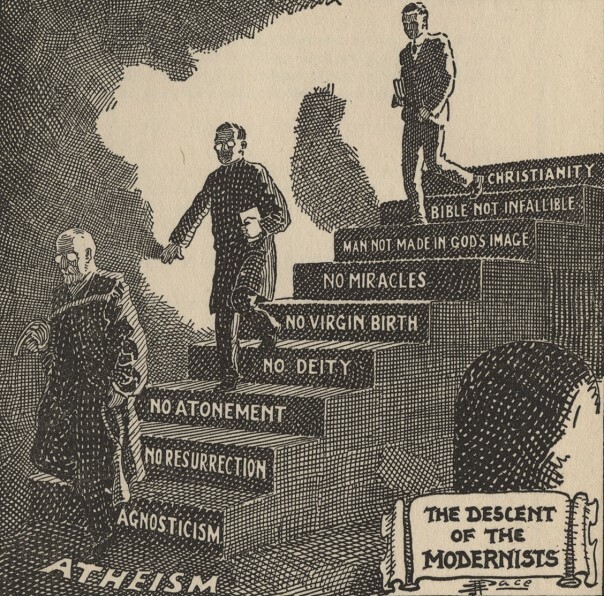 PHS also holds documents related to prominent fundamentalists such as John Gresham Machen  and Carl McIntire .